Huashizaoyuan compound, 5A luxury apartment within 2nd ring Beijing. 7 floor of 21 floor building, Fully decorated 142 sqm. 3 bed room, 2 wash room apartment with living facilities. Walking distance to Tian An Men square, Wangfujing, Hongqiao, Temple of Heaven, Beijing Railway station, Chongwenmen, Jianguomen, Longtan lake park, Shuangjing and Guomao. 5 subway lines passing by. Direct rent from landlord (me), so no brokerage fee. Availble for long term rent. Can also be used as small office. 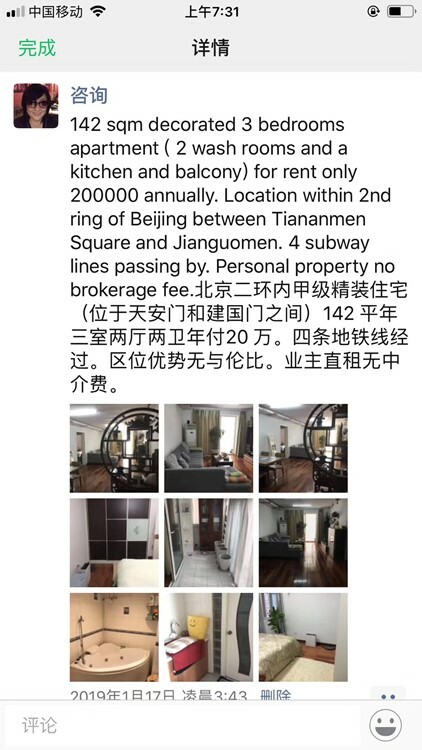 Annual rent payment around 200K RMB (price negotiable). Add wechat: consultprc for more detail. I'm interested in the property located in Dongcheng District for 17000 RMB. Please contact me. Thank you.